Tacoma shocks Seattle 14-11 in playoffs! 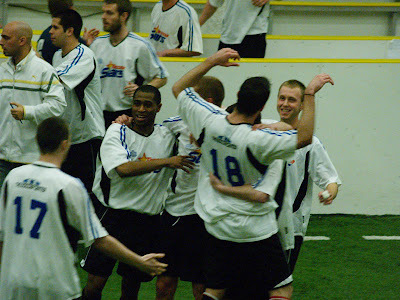 Tacoma Stars players react with joy (top) after the whistle blows on their 14-11 victory over the Seattle Wolves on Saturday March 8th. 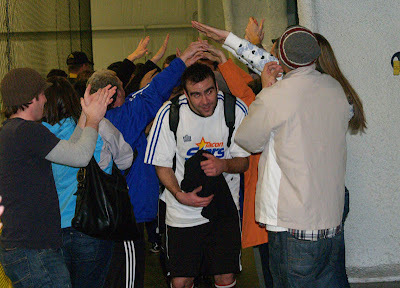 Traveling Tacoma fans (bottom) form a tunnel for the Stars on their way to the showers. Tacoma's Stars waited until the playoffs to shine against Seattle, but when they did the glow was bright enough to blind the Wolves out of the playoffs. The Stars bolted to a gigantic lead in their playoff semifinal match with the Seattle Wolves at Starfire Sports Complex in Tukwila on Saturday March 8th. It was 12-0 Tacoma at the end of a dominating first half. Seattle rallied in a rough second half that saw numerous power plays and a red-card ejection on the Stars' Nate Ford. The Wolves used the advantage to outscore Tacoma 11-2 in the second half and draw to within 14-11 with under five minutes to go. Stars fans formed a human tunnel in front of the visitors locker room and the winners smiled, hugged and gave hive-fives to families, friends and fans. The Stars did not beat Seattle in the regular season, both times (a loss, a draw) losing large leads. Turns out the 12-0 (6 goals to 0) was just enough. Tacoma advances to the PASL NW Final tomorrow night against either Snohomish or Wenatchee. The winner of that match is off to the International Finals in Virginia next week. We'll have more photos and videos up sometime on Sunday.